Since I've gone through pretty much everything we do for each subject, I thought I would take one post to talk about how I go about doing my planning. I realized that I didn't include some information in my subject posts like how often we actually do each thing. So I'm going to be brave and let you all have a peek into my plan book. My plan book's main purpose is to serves as a sort of spatial checklist for me. You can see it larger if you click on the pic. When I begin planning, I usually start with grammar and fill in the information from the First Language Lessons book. The numbers in the corner are the lesson numbers, and the objectives are pretty much what is listed at the top of each lesson. I fill this in first because our copywork and handwriting are usually dependent on what we do for grammar. We were doing the lessons twice a week and reviewing the poems for recitation on the other days, but we got behind for a variety of reasons, so we're doing 3-4 lessons a week for now. I do my planning on a weekly basis because a lot of it depends on the books I am able to find at the library. I like to coordinate history and reading, also, since I don't want to require extra independent reading if we'll be reading a longer book for history (like Secret of the Andes was here). I also like to have the flexibility of changing things up if lessons are going really well or not so well which is difficult to do if you write things out way ahead. This is where gathering all the reading lists and having the memory work set out for me are very helpful because I already have a plan to work from each week. 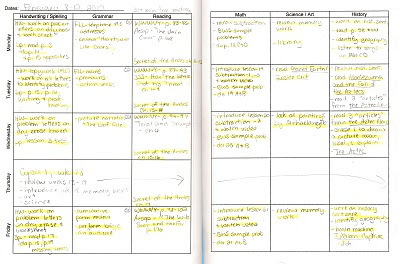 After I get the grammar and handwriting down, then I add the spelling, planning for 2-3 days for each lesson. Then I fill in history breaking up the readings I have that are applicable to the week's history sentence. I keep in mind the materials we have available, and I break it all up throughout the week including geography work some days. Next, I look at the Ambleside Online reading schedule and break up the material throughout the week with or without independent reading depending on history. Some weeks seem sparse to me, and I'll add in an extra story from The Blue Fairy Book (which are older versions of traditional fairy tales) or a similar book. I do have issues with some of the Aesop fables not being in our book, so I just pick another one. I then fill in the math according to how quickly I anticipate us moving and skills we need to drill. Finally, I add in any books or activities I have that reinforce our fine arts focus and science memory work for the week. That can be library books, viewing art online, coloring and labeling diagrams for science, or similar activities. As we go through each day's work, I mark through things with a highlighter when they are done. This allows me to quickly see what we've covered, anything I might have forgotten, and things we just didn't get around to. I make my plans in pencil so that I can change things up if I need to. I can move something we didn't cover to another day. I like to be able to keep track and make changes in writing, so this is the system I came up with. Also, just because two things are under the same subject doesn't mean they have to be done back to back. I call my plan book a checklist because I see that I'm meeting my objectives for all the subjects each day, but I can attack them in whatever order is necessary and mark them off as I go. I've just started adding in a skinny column on the far right to mark off that we've reviewed our memory work for the day. I like to be able to mark that off, and I plan to add that to the page when I make a new book. I don't know if all this is helpful to anyone or not, but I often find it interesting to see how people organize things. Plus, I wanted to show how quickly my process goes when I sit down to plan. It's mostly a matter of recording which books and pages we will be using each day with blurbs about what we're covering. I do plan to share a few more random thoughts soon to wrap everything up. I would really love to hear from any of you who might have questions, though. Is there anything that didn't make sense or that I might have left out? My goal in all of this has been to help others see one way of doing homeschool classically in the younger grades. Crystal, I have really been enjoying your homeschooling posts. It has encouraged me in our homeschooling journey. We just started with this school year - our oldest is in kindergarten. We're using the My Father's World curriculum, and it's working well for us. I also have a three year old, and we're expecting a baby this summer. Thanks, this was really helpful! Just starting out with or first grader, and had been feeling a little overwhelmed! I've been trying to plan out all of next year at once, and your post really helps to simplify things.